Here’s the newest thing I know as of today: wooden buildings could be as high as 30 storeys tall, according to at least one architect, who apparently isn’t crazy because the linked article didn’t include a photo of the man that could be (mis)interpreted as wide-eyed lunatic. There’s already a 9 storey apartment building made out of wood in England, and the secret is the kind of wood – it’s engineered timber, basically, which comes in “planks” measuring 10 by 40 feet and up to 16 inches thick. 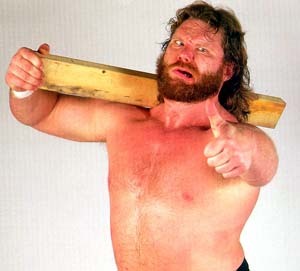 Eat your heart out, Hacksaw Jim Duggan! It's the wood that makes it good. Or at least ludicrous. Wood at that scale doesn’t burn well, claim the people who make it (“setting a twig on fire with a match is easy; trying to light a log ablaze is futile,”) and I’ve got to figure it’s structurally as strong as anything else out there. Even the name, cross laminated timber, sounds sturdy. Not necessarily as natural as the term “wood” would have you believe, but at least as wooden as my kitchen cabinets. I guess my final judgement depends on how much of the 30 storey building is wood and how much is glue, but here’s something that’s one of the older things I know: every ton of concrete produced creates another ton of carbon dioxide through heating the kiln and something called calcination. Wood, on the other hand, is a carbon sink, and since I’ve got nothing else to close this, some realtor needs to pitch a brochure involving something about the kitchen sink being inside the carbon sink. Badump-bump.